Unavoidable Hyphen reports on three contracts that formalised a cross-arts collaboration between vocal artist and Senior Lecturer in Performance, Yvon Bonenfant (University of Winchester, UK) and visual artist Ludivine Allegue (EsPAS, Institut ACTE, Paris 1 Panthéon-Sorbonne University-C.N.R.S). The essay envisages the context, creative aspects, production, funding and contracts for such collaboration. In its final part and conclusion, it also attempts to show alternatives for independent art research to be funded and new statuses such as the artist-researcher to be defined. I will not analyse Practice as Research’s state of the art . As an artist-researcher, I will report on particular cases which are to be envisaged within the context of Art Research in Southern Europe. I have noticed on several occasions how challenging it is to articulate the making of art works with the contribution to a body of knowledge within academic art research from a merely practical point of view. There is still a common belief that the reason why artists should be interested in developing art research at a university is to make a living out of it. In light of many researchers’ [lack of] earnings within the academy, and the current involution of their expectations for the future, I would rather support that there is a vocational reason for why some artists are willing to endure the academy’s twists and turns to progressively build an art research corpus. But I believe there are also obvious administrative reasons, as both the cultural and the academic institutions are in the process of opening up and adapting their modus operandi to allow the development of art-research projects. In the UK, the Centre for Research into Creation in the Performing Arts (Rescen) at Middlesex University has been hosting associate artists who reflect, document and share their creative processes, since 1999. Rescen’s head, Chris Bannerman, is also a dancer and a choreographer . The initiative is radical; Rescen emerged as an enclave within academic territories, as a place where artists and creative processes determine the agenda. In 2001, still in UK, the University of Bristol launched the PARIP (Practice as Research in Performance) project, which focuses on the issues that practice-based research methodologies raise in terms of creativity and research. PARIP’s concerns include the documentation and dissemination of such processes and the assessment criteria for both PaR methodologies and research outputs within academic context, the latter being closely linked to funding. As a matter of fact, research bodies do not normally fund creation, which hampers the acceptance of art research projects that present the creative process as knowledge-producing. The anglophone academic community working in the arts field uses two nouns to refer to individuals who *practice* art : “practitioner” and “artist”, which the Oxford dictionaries respectively define as follows : “a person actively engaged in an art, discipline, or profession, especially medicine” and “a person who creates paintings or drawings as a profession or hobby”. Being a francophone, the terminological distinction piqued my interest, so I sought an equivalent in French. Again the Oxford dictionnaries appeared as a key resource as I learned that the origin of the “practitioner” term dates back to the 16th century and it is an “extension of the obsolete practitian, variant of practician”, the latter, in turn, having its origin in the late 15th century “Old French practicien, from practique ‘practical’”. Ah! What about the “artist” then? The Oxford dictionaries explain that the origin of the term “artist” is as follows: “from French artiste, from Italian artista, from arte ‘art’, from Latin ars, art-.” Sacrebleu! What does the Larousse say? According to the Larousse dictionary, the praticien “exerce son art et a la connaissance et l’usage des moyens pratiques par opposition à ‘théoricien’” (exercises his/her art and knows the practical means to this end, as opposed to ‘theorist’) whereas the artist “exerce professionnellement un des beaux-arts ou, à un niveau supérieur à celui de l’artisanat, un des arts appliqués” (professionally practices one of the fine arts or, at a higher level than crafts, one of the applied arts). As far as I remember, I had never heard the term “praticien” used in the context of art research in France. My first reaction was therefore to wonder whether the practitioner was a sub-artist. The Oxford definition stipulates that the practician is actively dedicated to his/her art, while indicating that the term is rather applied to medicine, whereas the artist “creates”. The other distinction also lies in the nature of the arts concerned: the first one does not specify, the second seems to focus on fine arts and, in so doing, echoes the French definition. Finally, both definitions of the artist are in accordance with regard to the professional dimension of his/her artistic activity. Thus, to put it in plain words: the practitioner would practice art but s/he would not *create* art and s/he would not make a living from art. This is quite disturbing: is the “practitioner” term used for humility, lucidity… or pragmatism sake? Both dictionaries seem to agree on the more scientific, even medical, characteristic of the practician/practitioner’s activity, yet I read with horror among the multiple definitions of artist in Larousse (six in total versus three for practitioner): “Familier : bon à rien, fantaisiste.” (Familiar: good-for-nothing, fanciful) The practitioner suddenly gains a new dimension. So does the Rescen initiative. The artist, fetishised and unattainable, is also routinely suspected of deception. What scientific value might his/her work have? Is replacing artist with practitioner half a solution? Until s/he gains the trust of the funding bodies? I am afraid the substitution only corroborates this idea that the artist is a harmful specimen for research. And the research enclaves that bloomed within great museums and European art centres (e.g. the Tate Modern in UK, the Matadero in Madrid-Spain, the 104 in Paris-France) allow me to hope that the artist is becoming a credible researcher. The key for the artist-researcher status may thus lie in the hyphen. It is not methodology. It is not the associated artist questioning his/her work. It is a return to the origin, the core of the reflection process; it puts the human back at the centre of the process. The term per se sweeps away the necessity to justifiy the fact that a creative process is also a methodology and it legitimates it as part of the research. But it also gives rise to practical issues, such as, for example, intellectual property or the possible marketing of the research outputs. I will report on three contracts that formalised a cross-arts collaboration between vocal artist and Senior Lecturer in Performance, Yvon Bonenfant (University of Winchester, UK) and myself. The main aim of the written agreements was in fact to fairly determine the ownership, copyright and marketing of three interdisciplinary art works that resulted from two funded, international and collaborative art research projects. Although the three works involved further artist-collaborators, this essay will only address the specificities of my collaboration with Yvon Bonenfant and how these were reflected in the corresponding contract for each work. In order to provide a precise report on the contents of the contracts in relation to the described works, I have edited the original texts of the documents that Yvon Bonenfant redacted following our negotiations. 1 – B(EARTH) is an installation and integrates painting, voice and video. It was made in two stages: A) a two months’ residency at the Ecole Nationale Supérieure d’Art Limoges-Aubusson (French Ministere de la Culture) where a four-metre painting and a 21-minute vocal composition were created; B) the video was shot during the first exhibition of the painting-voice installation and the preview of the painting-voice-video installation. It was part of a larger scale project by Yvon Bonenfant: “extending vocal bodies into audiovisual media”. 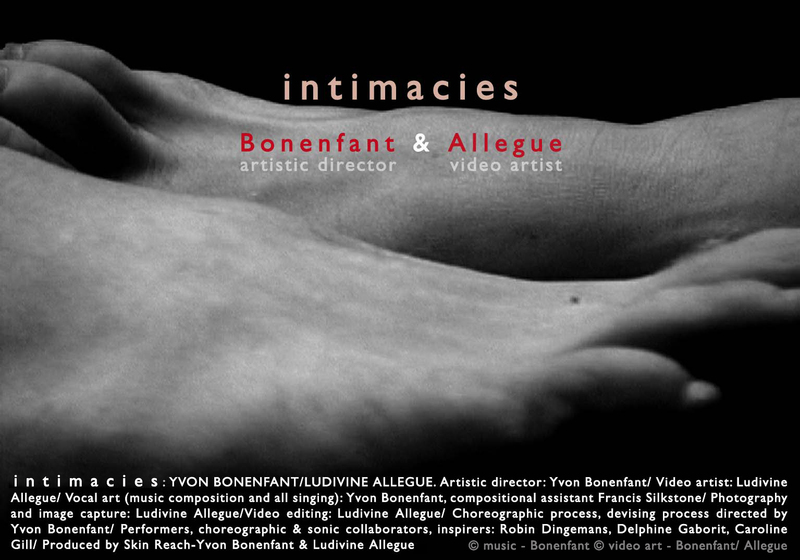 2 – INTIMACIES is a video-art/music/choreographic collaboration realised within Bonenfant’s “extending vocal bodies into audiovisual media” project. It is a development of an existing performance created a few years earlier by Bonenfant with the Choreographic Lab (University of Northampton). 3 – BEACONS is a musical video art also realised within the “extending vocal bodies into audiovisual media” project. It is a creation and has subsequently been developed as a performance by Bonenfant . The three pieces were financially supported by the University of Winchester and the British Academy (UK); they were technically supported by the Institut d’Esthétique des Arts et Technologies (UMR 8153: CNRS/ Paris 1 Panthéon Sorbonne). B(earth) had additional financial support from the Institut d’Esthétique des Arts et Technologies (UMR 8153: CNRS/ Paris 1 Panthéon Sorbonne) as well as technical support from the Ecole Nationale Supérieure d’Art Limoges-Aubusson (French Ministere de la Culture) and the University of Glamorgan (UK). 1 CREATIVE ASPECTS: WHO CREATED WHAT? The ownership and copyright of each work were directly determined by whose original idea it was on one hand and the nature of the creative work each of us brought to the projects on the other. Then, to a more limited extend, production aspects were considered. Every piece supposed subtle differences in our creative involvement, which I will approach piece by piece and following a chronological order. Painting and voice composition: 9 May – 13 July 2007, in residence at the ENSA Aubusson (FR). Video: shot in Paris and Cardiff  and edited in Paris in summer 2008. B(earth) emerged from an art research project investigating the question of texture in both image and voice. It was to be a video only but my practice background in fine arts led me to suggest that we should start investigating the links between painting and voice first, because of the nature of painting that is texture. We agreed to split the project in two: the first stage would be a painting-voice work, the second stage would introduce the video element. I started making a four-metre painted-fragmented image in residence at Aubusson and soon Yvon joined me to start working on the vocal composition. Although he discovered an existing object when he arrived, that image was far from being complete and we worked in a permanent dialogue between painting and voice, one practice-vocabulary feeding into the other, opening unsuspected routes in ourselves for image and sound making, and research. This way we found a perfect equilibrium in our collaboration: in a neutral place, far from all administrative obligations and everyday life. Yvon completed the final edit of his 21-minute multi-track voice composition at the University of Winchester’s studios, away from our residency. That first stage turned out to be the strong base we needed to shoot the video one year later, during the first exhibition of the painting-voice installation in Paris. Yvon had considered ‘amending’ his initial composition but felt he had nothing to add *vocally*: he was in front of an object made of wood, canvas, painting and his recorded voice. It felt very much like a finished object for him (Bonenfant 2008: 249) and from my point of view it was also more interesting to explore the spatialisation of the object than creating a distinct image. So, again with equal involvement, we filmed the painting to create a mirror that would play with movement and space. Regarding movement, we used both fixed and moving cameras and filmed each other within the installation’s space to introduce human body presence in the work. We explored space, playing with scales and different distances between the bodies and the painting. I then completed the shooting during a preview of the installation, integrating the video component at the ATRiuM of Cardiff, filming details, especially video and fabric textures, of the projection onto the moving curtain. I completed the final edit in Paris. We had one week shooting with two dancers and a voice/movement artist at the University of Winchester studios. Yvon, who also acted as a performer, directed the choregraphic and performative processes: there was no script, no story-board and no film direction. I started drawing what I was viewing; the filming then started soon after. The act of filming was close to live art in this context, as the experimental nature of the choregraphic and performative processes prevented us from rehearsing. I filmed all the improvisations by ‘improvising’ myself. After different tests with the lighting, I followed my eye’s movement and my own reception of the whole performative process for the composition of a bi-dimensional moving image that, afterwards, should allow the video viewer to enter both the collective and five individual processes: that of Yvon and the performers’, and my own. In fact, I became more involved in the performative process: I was on stage, with the dancers. And the camera finally disappeared. They acted as if I was one of them, although I wasn’t. Then Yvon, basing his work on the performative work of the week and some raw footage, composed a 25-minute multi-track vocal piece which he gave me and I edited the images on his final vocal composition. No original sound from the raw footage was used. Like B(earth), Beacons was a creation, but it emerged from a very personal idea of Yvon’s. Beacons is an allegory of a decisive instant in his life. Even though he essentially directed the performative process and had to rely on me for the images, he had a clear idea of the visual atmosphere he wanted on the video; I composed the images to create within the video frame the particular atmosphere he was seeking, and recreated the one he had created on stage. Again he composed a 15-minute multi-track vocal piece that emerged from the performative process and the raw footage, and I edited the images on that sound-base. The most creative part of this work started for me with the video editing: the visual writing of Yvon’s story. 2 PRODUCTION: WHO PRODUCED WHAT? The three projects were subject to different fund-raising stages and a further application for travel expenses for the second phase of the collaboration. B(earth) had emerged from a mutual wish to develop an art research project together. When the stages and narrative of our idea were clarified, a first funding application was submitted to the University of Winchester by Bonenfant to fund the making of the painting/vocal composition, while I started seeking a work space in France and some additional funding for travel and transport from the Institut d’Esthétique des Arts et Technologies (IDEAT: CNRS, Panthéon-Sorbonne University). Then Yvon submitted a second application for a larger-scale art research project based on the first step of our collaboration and several of his personal completed works. This second application (also submitted to the University of Winchester) would fund most of the video-making process for B(earth). 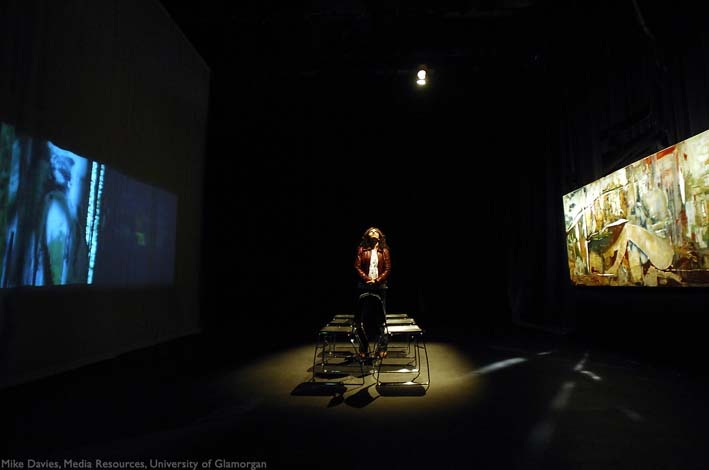 So production of the first artefact is part of two collaborative, cross-disciplinary and international larger-scale practice-led research projects that both involved subsequent pedagogic integration of the creative processes into undergraduate teaching and learning at the University of Winchester, as well as different academic communications and papers. The first research project, ‘Textures: visual, tactile and vocal collaboration in devising from performance to classroom,’ covered salaries and cost of supplies. In addition it funded a two month art residency for me at the Ecole Nationale Supérieure d’Art (ENSA) Limoges-Aubusson (French Ministère de la Culture), including accommodation, and further support from the IDEAT for my travel and transport expenses for the installation. One year later, the video filming of B(earth)‘s was mainly funded under the second phase of the collaboration/second fund-raising stage. I contributed to the hiring of material and line production in France, and ensured the video post-production in France as well. The second fund-raising stage concerned the making of B(earth)‘s actual video, intimacies and Beacons. Yvon combined the three video projects into one art research project: “extending vocal bodies into audiovisual media”. He acted as the line producer working on day-to-day financial and production matters, especially for the intimacies and Beacons filming and sound creation processes. While Yvon completed the sound production with his own mobile studio in the UK, I took care of the video post-production in Paris with my own studio facilities as well. All the travel expenses for the second research project were funded by the British Academy, following a further application by Yvon. VISUAL and MEDIA ARTS vs. LIVE ARTS? The differences between the live arts and media/visual arts productions in terms of ownership and rights can lead to misunderstandings when it comes to contract negotiations. For example, I would like to clarify what was intended by crediting Bonenfant as an artistic director for intimacies and Beacons. Yvon’s field is live art and the term ‘artistic director’ is to be understood according to live art standards: he acted as producer and director for both pieces and not as a production designer as it would be understood in film. On the other hand, the visual artist’s status was respected, meaning the authorship of his/her images is acknowledged whether s/he is creating images within a project whose original idea is not his/her own (as was the case for intimacies and Beacons) or not. None of us was fully aware of these differences between live and visual arts. This is the reason why, since the three pieces were integrated video art, I consulted contract templates available on the SCAM website (Société Civile des auteurs multimedia) to help find a formulation with Yvon that would meet both live and media/visual arts standards. The final contracts determined the ownership, copyright and marketing of the works, and took into account their possible developments into further installations and/or a performance integrating the video images. The following part of this article will reveal and explain how our respective contributions to the three works were reflected in their corresponding contracts. I will address the three contracts in chronological order: not the making of the pieces but the writing and signing of contracts. The three contracts were discussed after the completion of the works so the negotiations took place on a who-did-what base. Intimacies was the most complicated to formulate, partly because it was the first one to be discussed. Although the original project was Yvon’s, I had received no film direction and had composed the images and the visual narratives in absolute freedom. In other words I did not act as a performer but as an author who re-interpreted what Yvon was creating on stage. – the proportion of ownership should be as follows: Bonenfant: 53%, Allegue: 47%, suggesting that any profit made from the product must be divided according to those percentages, but either Bonenfant or Allegue may show the film individually as part of academic events or artistic meetings where their work is featured, or where they are an invited lecturer, guest speaker or artist. In this case, any stipend or payment Bonenfant or Allegue might receive for this is not subject to the 53/47 share rule. – Bonenfant should be free to use the footage in developing live performance if there is no financial gain from the live performance, as long as the video artist is credited. – if Bonenfant makes a performance where the performers get paid, Allegue’s work as video artist should be treated in the same way as a performer’s presence and will be paid the same amount as the performers even if she is not physically present. – if Allegue uses the footage in any other art project, she should credit Bonenfant as ‘choreographic director’ as well as the dancers. If money is made from such a project, Bonenfant should be paid 20% and Allegue 80%. This excludes the sound. – if Allegue wishes to use the sound, she should negotiate a contract with Bonenfant or with the record company responsible for the copyright. – if Bonenfant makes an installation or performance with Allegue as part of the directorial team, they should negotiate a contract specific to the making of that performance. The minimum payment should be as a co-performer, but Allegue may be paid more than/as much as Bonenfant should the resulting art piece merit such payment in the eyes of the artists. – both have the right, at any time, to submit this project to festivals as they see fit and must notify one another of any acceptance. – both have the right to create brief excerpts or edits of the work for promotional purposes, as long as proper crediting takes place; but they must ensure that they never edit down the film in a way that makes its entire content available for free in the public sphere. – both may enter into negotiations, or enter the video into competitions, with distributors, to have the audiovisual product distributed. However, in this case, they must notify one another. Performers, choreographic/sonic collaborators, inspirers: Robin Dingemans, Delphine Gaborit, Caroline Gill. Although this was a creation (it did not come from a previous performance or art work), Yvon’s particular personal involvement in this piece curiously made the negotiation of the contract easier. Excepting the question of copyright, he initially suggested a fairly similar contract in terms of ownership. But the nature of his Beacons experience raised the question of moral ethics and I felt that the percentages should reflect his particular relationship with the piece. – copyright for this project, audio and visual, should be owned exclusively by Yvon Bonenfant. – Bonenfant can use the raw footage from Beacons in any way in workshop/development/showing environments to convert it into a live performance or performed installation. If he uses the footage as edited by Allegue, she has to be notified. – if Bonenfant makes a performance where the performers are paid, Allegue will be paid the same amount as the performers, even if she is not physically present, if the footage taken is used in the same format as her final video edit. Bonenfant has the right to use raw footage as he sees fit and without remuneration if it is not used in the edited format. – if Bonenfant makes an installation or performance with Allegue as part of the directorial team, they will negotiate a contract specific to the making of that performance. The minimum payment will be as a co-performer, but Allegue may be paid more than/as much as Bonenfant should the resulting art piece merit such payment in the eyes of the artists. 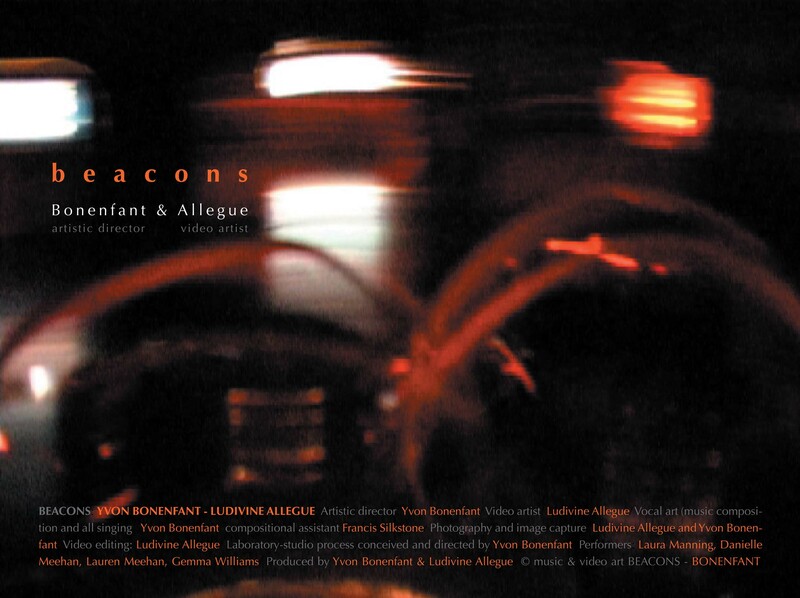 – if Allegue wishes to use the footage from Beacons in any other art project, she must gain permission from the copyright holder, Bonenfant, and negotiate a price for the images which is appropriate to the project. Laboratory/ Studio process directed by Yvon Bonenfant; Performers : Danielle Meehan, Lauren Meehan, Laura Manning, Gemma Williams. B(earth) was the easiest contract to discuss due to the fact that all aspects of the idea/creation/production were equally shared. – copyright of the visual material, if dissociated from the whole installation, should belong to Ludivine Allegue. If Allegue wishes to sell the painted portion or video portion of the work without including the sound, she may do so after negotiating an agreement with Bonenfant; he will receive 20% of the value of the work if it is sold. If she wishes to sell reproductions of the painting or video she may do so without his permission and he will keep no portion of the revenue. – copyright of the audio material should belong to Yvon Bonenfant. He may distribute the audio material via any means he sees fit, and may enter into agreement to distribute the sound via a music label or other music sales outlet. If he makes money from this, 20% of the profits from sale must be given to Ludivine Allegue. – Either Bonenfant or Allegue can use any of the video material or documentation of process in any form of academic writing or teaching in studio in perpetuity, as they see fit. – It is understood that B(earth) is a complete work. If either artist wants to further develop it into another work, s/he must enter into negotiation with her/his collaborator. Sound, voice: Yvon Bonenfant. Compositional assistant: Francis Silkstone. Finally, given the specific nature of each work, the three contracts stipulate that the agreements may need to be renegotiated if we find out that they are not functional. Could these three agreements serve as investigational models within art research and art and culture industries which have been claiming their interest in international and cross-arts research/production projects for years without yet finding out how this kind of production may be legally formulated? Within a project I am currently developing across painting, video art, live art and online documentation/diffusion, a film producer I consulted stated, when it came to talk about contracts, that he had no expertise in the live and visual arts and could not see how all the layers of the collaboration could be merged into one contract. He added that this point would hamper production of the whole project, at least within the film industry. The choreographer/dancer I am working with on this project received similar feedback when she consulted live arts producers. Artists and researchers find their projects limited by administrative and legal processes inherent to the funding, creation, research and diffusion/dissemination of cross-arts and/or practice based projects. This is actually the issue that the recent seminar on “Artistic research, its distribution and criteria for evaluation”  at the Museo Nacional Centro de Arte Reina Sofía in Madrid, addressed (http://www.museoreinasofia.es/actividades/investigacion-artistica), though the seminar also tackled a few common beliefs about the suitability of art research in the current contemporary art background. Freelance journalist Belén Palanco (the Arts Newspaper, SPN, London), after identifying where money was being invested on art and art research and by whom, shared her conviction about the bright future of artistic research. While she was doing so, the main resources that emerged for such research funding were essentially corporate and from the cultural industries. Her talk seemed to echo an earlier article published by Doreen Carvajal in the New York Times about the funding strategies that are currently being tested in Madrid, at the contemporary and interdisciplinary art centre, Matadero: “In Madrid, Art Finds New Friends At Matadero, Red Bull Adds Money (and Energy) to Culture”  explains the nature of the partnerships that allow the Matadero to exist and function: private companies invest money and become fully involved in the spaces and curatorial projects of the centre which, of course, raises the issue of the extent to which art creation/research is inflected by its sponsors. Besides, administrative processes within the professional sector also have their limitations when it comes to exhibiting or distributing experimental and cross-arts works that are part of a research project. As a matter of fact, nearly every time Yvon and I submitted our works to short film festivals, video dance festivals or even to art centres , we stumbled on the existing forms. A major reason why we were able to make B(earth), intimacies and Beacons was that they were financially supported by academic and research institutions —which are normally less dependent on profit than cultural industries— and that we both ‘self produced’ various aspects of the creative processes. I believe this confirms the role that academic research can and ought to play in the definition of new status and production solutions in performing and visual arts. The privileged and strategic position of academic and research institutions that are bridges between the artist’s training and the industry’s realities favours the development of investigational models. Following Belén Palanco’s contribution to the “Artistic Research, its distribution and criteria for evaluation” seminar in Madrid, Michael Schwab, artist and editor in chief of the Journal for Artistic Research (JAR), presented this academic peer-reviewed online publication that chooses to give precedence to art practices. The journal gives the option to submit purely visual contributions. It poses the art work as complete in itself and allows the artists to disregard the submission of the work’s theoretical background. JAR is published by the Society for Artistic Research (SAR), which is integrally funded by its members, both individuals and institutions. This funding strategy grants SAR, and subsequently JAR, the privilege to take on their commitment to artistic research in its most speculative and experimental forms. Such strategy reminds me of the “arrêt sur images” case in France: arrêt sur images was a television broadcast by the fifth French channel, France 5. Its aim was to analyse how the media, particularly television, processed and disclosed the news. It was discontinued in 2007. Journalist and producer Daniel Schneidermann then opened an online subscription campaign and released the @rrêt sur images (@si) website in 2008, where he continued his programme. In 2009 the French government extended the aid program for the press to the online press. @si then openly chose not to apply in order to ensure its full independence . Its only funding therefore comes from the membership of its followers. They were far from being the only press website to do so (Mediapart, Rue89…). And as it turns out, it works. Can this be a relevant option for art research? I am convinced it constitutes a serious potential for groundbreaking independent art research to be developed. But most important, an independent administrative structure could be the starting point for defining new statuses such as the artist-researcher: a legal person who would finally match our reality. I have just spent several years fully devoted to painting at a troglodyte house-studio in the south of Spain. These years took me away from the world, particularly the academic world, and I therefore do not have the current expertise or legitimity to write on today’s Practice as Research’s context. Bannerman, C; McLaughlin, C (2009) “Collaborative ethics” in Allegue, Jones, Kershaw and Piccini (eds) (2009) Practice-as-Research: In Performance and Screen, London: Palgrave Macmillan, ISBN 978-0-230-22001-0. Supported by a commission from the Experimental Media and Performing Arts Centre of RPI, Troy, NY, USA. Artistic direction, voice, live performance: Yvon BONENFANT. Videographic editing and scenography: David SHEARING. Using footage by David SHEARING and Ludivine ALLEGUE. Compositional assistance and mixing by Francis SILKSTONE. Talmart Gallery, www.talmart.com, 13 May – 1 June 2008, Paris (FR) and Atrium, Cardiff (UK). 26-29 June 2008. “Artistic Reaesrach, its distribution and criteria for evaluation”, seminar at the Museo Nacional Centro de Arte Reina Sofía. 17 October 2014, 19:30. Organized by: Grupo de Investigación Creación ECI, Hum 654. Coordinated by Isidro López-Aparicio Pérez, University of Granada, Spain. Carvajal, Doreen. (2013) “In Madrid, Art Finds New Friends. At Matadero, Red Bull Adds Money (and Energy) to Culture”. New York Times, 23 Sept. 2013. A version of this article appears in print on September 24, 2013, on page C1 of the New York edition with the headline: In Madrid, Art Finds New Friends. 2010 – B(earth) at Senso comune – sala de arte Rey Chico, Granada, España. 5-26 de noviembre de 2010. 2009 – Allegue/Bonenfant – Alsager Arts Centre, Manchester, UK. 27 de Abril -1 de Mayo 2009. 2008 – B(earth) at Atrium, Cardiff, UK. 26-29 de Junio de 2008. B(earth) – by Allegue & Bonenfant. Allegue, L. “Un geste contient l’immensité” in Migrations/Mutations. Paysages dans l’art contemporain, E. Chiron dir., Paris, Pub. de la Sorbonne, ISBN 978-2-85944-649-9, ISSN 1268-7723. Allegue, Jones, Kershaw and Piccini (eds) (2009) Practice-as-Research: In Performance and Screen, London: Palgrave Macmillan, ISBN 978-0-230-22001-0. Bonenfant, Y. (2009) Enskinning between extended voice and movement: somatics, touch, contact and the camera. Journal of Dance and Somatic Practice, 1:1, pp. 67-87. Anzhi, Zhang (1992). L’esprit et le pinceau. Beijing: Edition en langues étrangères. Anzieu, Didier (1995). Le Moi-peau. Paris: Dunod. Arnaiz, José Manuel (1996). Las pinturas negras. Madrid: ANTIQVARIA. Banes, Sally and Andre Lepecki (eds) The Senses in Performance. New York: Routledge. Barthes, Roland. (1981). Le grain de la voix: entretiens 1962-1980. Paris: Seuil. Coquet, Jean-Claude (2007) Phusis et Logos. Une phénoménologie du langage. Saint-Denis: Presses Universitaires de Vincennes. Csordas, Thomas (2002) Embodiment and Experience: The Existential Ground of Culture and Self. Cambridge: Cambridge University Press. Davis, Will (2001). “Energetics and Therapeutic Touch” in Heller, Michel (ed.) The Flesh of the Soul: the Body we Work with. Bern: Peter Lang Academic Publishers. Deleuze, Gilles (1983) L’image mouvement. Paris: Gallimard. Fisher, Jennifer (2007). “Tangible Acts: Touch Performances” in in Sally Banes and Andre Lepecki (eds) The Senses in Performance. New York: Routledge, pp.166-178. Nachmanovitch, Stephen (1990). Free Play: Improvisation in Life and Art. Los Angeles: Jeremy P. Tarcher. Pallasma, Juhani (2005). The eyes of the skin. Chichester : John Wiley and Sons. Richard, Francis (1997) Splendeurs persanes. Paris: Bibliothèque Nationale de France. Salinas, Pedro (1934) La voz a ti debida. Barcelona: Losada (for the 1999 edition). Welton, Martin (2007) “Seeing nothing, now hear this…” in Sally Banes and Andre Lepecki (eds) The Senses in Performance. New York: Routledge, pp. 146-155. Yourcenar, Marguerite (1980) Mishima ou la vision du vide. Paris: Gallimard. Collection Folio. The Artist-Researcher: Paradox or Tautology? Researcher in Dance: Antinomy or Pleonasm?